Random fact you don't know about me, my dad keeps bees - five hives of them in fact, giving us delicious honey each year and plenty of it! He's been keeping them since I was about 10 and I've long been interested in the properties of honey, beeswax and other bee products! In fact, I take honey as a supplement to my hayfever medication, helping to introduce local pollens into my diet; I also use propolis moisturiser and lip balm if and when I need it and love the smell of beeswax candles! 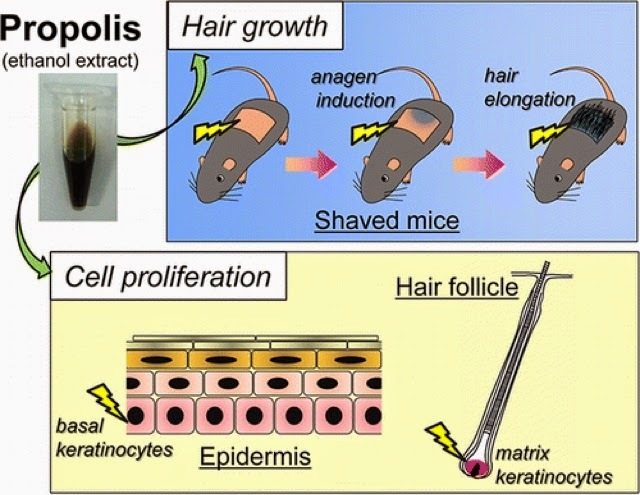 That's why I'm fascinated by a new study which suggests propolis extracted from beeswax can help prompt faster hair growth and potentially has implications for treating hairloss conditions too! Previous studies have looked at the effects of propolis on other things, including the fact that use on burns and wounds makes them heal better and they are less likely to become infected if coated with a propolis cream, although this has not been widely confirmed. It is known to have anti-inflammatory and anti-tumour properties and also stimulates the production of keratinocytes which are vital for follicle shaft production, and it is this which is believed to support the reversal of hair growth.